Last night, DJ Mag revealed the results of their Top 100 DJs Poll 2016, announcing Martin Garrix as this year’s winner. The 20-year-old Dutchman is the youngest ever No.1 DJ, and takes the top spot from 2015 winners, Dimitri Vegas & Like Mike. 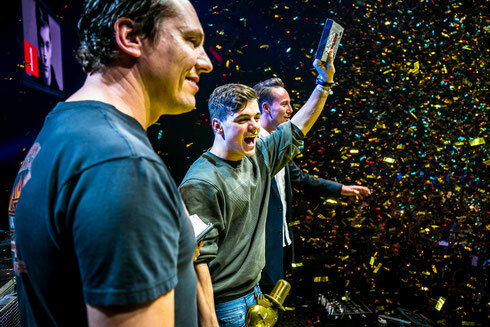 Martin was awarded the No.1 trophy by his mentor, Tiesto, on stage at the Top 100 DJs Poll Awards Party at the Heineken Music Hall. The event was the opening party in this year’s AMF, apparently the largest festival of the Amsterdam Dance Event (ADE). This year, votes in the Top 100 DJs Poll apparently came from across the globe. The most votes came from the US, followed by India, Brazil, Mexico, Belgium, Netherlands, UK, Germany, Spain, Italy, France, Russia, China, Japan and beyond. The UK’s Top 100 DJs party returns to the O2 Academy Brixton this Saturday 22 October and the line-up includes Armin van Buuren, Gouryella, Markus Schulz, W&W, Marlo, Tenishia, Tom Swoon, and Gavyn Mytchel.